Viruses are the most abundant biological entities throughout marine and terrestrial ecosystems, but little is known about virus–mineral interactions or the potential for virus preservation in the geological record. Here we use contextual metagenomic data and microscopic analyses to show that viruses occur in high diversity within a modern lacustrine microbial mat, and vastly outnumber prokaryotes and other components of the microbial mat. Experimental data reveal that mineral precipitation takes place directly on free viruses and, as a result of viral infections, on cell debris resulting from cell lysis. 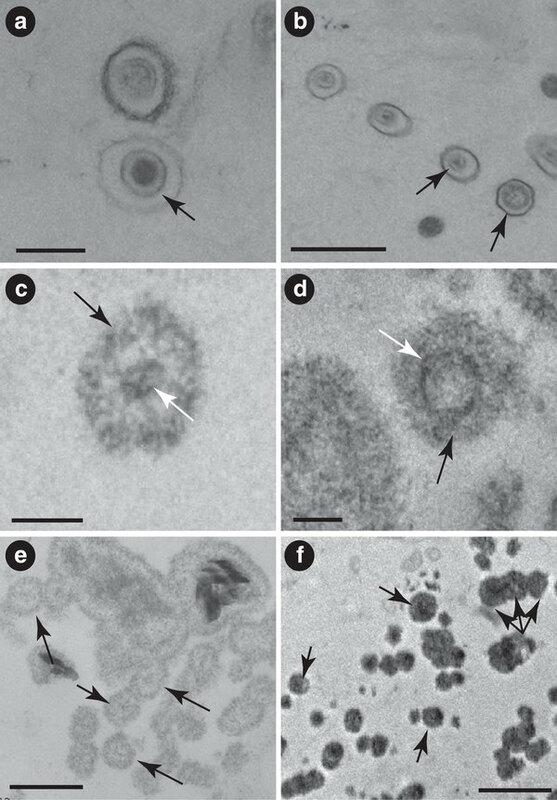 Viruses are initially permineralized by amorphous magnesium silicates, which then alter to magnesium carbonate nanospheres of ~80–200 nm in diameter during diagenesis. Our findings open up the possibility to investigate the evolution and geological history of viruses and their role in organomineralization, as well as providing an alternative explanation for enigmatic carbonate nanospheres previously observed in the geological record. While the authors seem primarily concerned with how viruses could affect the chemical formation of geological features, if real, this has the exciting potential to allow us to track the evolution of viral morphology through geological time. (a) Virus-like particle characterized by an icosahedral capsid-like structure (black arrow). Scale bar, 200 nm. (b) Virus-like particles. Black arrows point to the capsid-like structure in each case. Scale bar, 500 nm. (c) First stage of the amMg-Si mineralization process of the icosahedral capsid-like structure (black arrow); white arrow points to the viral DNA inside. Scale bar, 100 nm. (d) Second stage of the amMg-Si mineralization process of a virus-like particle (black arrow) showing its icosahedral capsid-like structure (white arrow). Scale bar, 100 nm. (e) Early mineralization of virus-like particles showing amMg-Si permineralized capsid-like structures (arrows). Scale bar, 200 nm. (f) amMg-Si permineralized virus-like particles occurring as single entities and chains (examples arrowed). Scale bar, 500 nm.